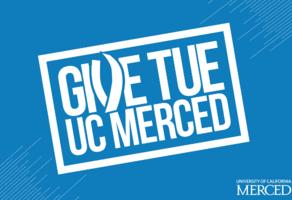 UC Merced is building the future – one gift at a time. On November 27th, join our students, staff, faculty, alumni, family and friends as we aim to surpass 1,000 donors in a day. Will You Give Tue? 24 Hours. 4X the Impact. Help Build the Future in the Heart of California. Will You Give Tue? Make an impact at the University of California, Merced!